Color night vision provides a clear picture even after dark, and the 180-degree angle ensures a wider viewing area. It is NOT compatible with older Arlo HD Base Stations. Compatible with select Arlo Ultra systems. Each NR9082X Includes Lorex Secure™ Enabled. NVR Features. Easy PoE installation and other custom NVR settings to monitor smarter. 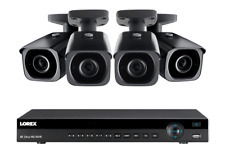 Platform 4K NVR systems 2K NVR systems 1080p HD NVR systems 720p HD NVR systems 1080p HD DVR systems.